Firefighter Bailout Training in Westchester County, NY in fall of 2011. 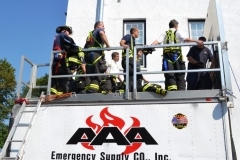 Firefighters received basic end user training in the use, function, and basic maintenance of their RIT Emergency Escape Systems, while utilizing the AAA Emergency Supply Mobile Training Unit. Bailout Demonstration with the Wantage Township Fire Departments. AAA Emergency Supply Instructors working with firefighters from the area to demonstrate the use and deployment of the RIT Emergency Escape System Rope and Webbing models. 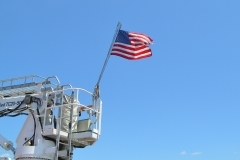 In June of 2011 Matt Manfredi, company president, participated in a series of foam test evolutions on the Fire Department of New York’s (FDNY) new Fire Boats. Representatives from National Foam and FDNY were leading the evolutions. 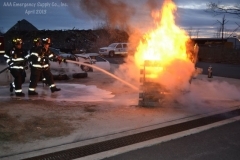 On April 23, 2013 AAA Emergency held a F500 demonstration hosted by the West Harrison FD at their fire training facility. 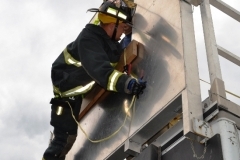 F500 is an encapsulator agent which fights all types of fire more effectively and efficiently.